I went to a Bobby’s Burger Palace at Mohegan Sun back in 2009. I thought it was a decent burger at a reasonable price. Earlier this year, Bobby Flay expanded his empire to include a location in the Burlington Mall. It’s strange – there is no entrance from inside the mall itself. I wonder why they would do that? Nicole and I had an evening of intense shopping, stopping only when the mall closed at 9pm. We were pleased to discover that the restaurant is open till 10pm on weeknights and 11pm on weekends. The place was virtually empty, with only two other patrons. You walk in and order at the counter, find a seat at the communal tables and wait for the food to arrive. I got the LA burger (avocado relish, watercress, cheddar and tomato) ($7.75). Nicole and I shared an order of onion rings ($3) and a pistachio shake ($5). I opted to have my burger “crunchified” which means it is topped with a handful of potato chips. The patty was medium rare and my bun was toasted (which is an improvement over my 2009 burger). The flavor was good and I liked the crunch of the chips. Some people complain about the size of the burger, but I thought it was just fine. The avocado relish was lacking in flavor. Plus, why can't they just call it what it is, guacamole? 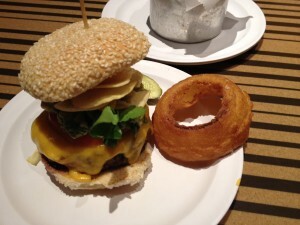 I really enjoyed the onion rings – they were huge (look at the picture below - it's the size of the bun! ), golden brown and crispy. They were generously salted. The beer batter was thick enough to cling to the onion, but not doughy (another improvement). There were only 5 rings in the order, but given their size, it was plenty for us to share. The shake was thick, smooth, and creamy and had good pistachio flavor. I always appreciate when it is not an artificial bright green color. I think my original opinion remains - decent burger at a reasonable price. Bobby’s Burger Palace is not a destination, but a really good option after a long shopping spree.